Sports movies, like romantic-comedies, have a formulaic structure which if done right can have a good effect overall on its audience. Famous examples such as The Mighty Ducks and Rocky may stick to it like glue, but there was enough passion behind them to make them entertaining without the feeling it was half-assed. 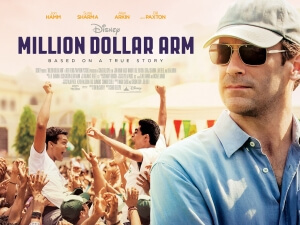 This being Disney, you can tell while watching Million Dollar Arm there’s at least some effort being put into building toward a film that’s both entertaining and heart-warming despite its obvious moments where the formula shines through. It may not amount to much in terms of being a new classic of the genre like those films turned out to be, but as a genuine crowd-pleaser it’s decent enough. Director Craig Gillespe manages to keep the focus not as much on the sport of baseball but rather on the people involved in this particular story. Intimate – and at times a little obnoxious – close-ups on characters’ faces reveal the emotion behind their struggles and discoveries, and though they are a bit too in-your-face (no pun intended) the intentions of the Lars and the Real Girl helmer to get us to feel for these people is evident. Gillespe also does a fine job in bringing to life the script by Thomas McCarthy (the filmmaker behind The Station Agent and Win Win) which, though troublesome in its characterisation – more on that in a bit – and not without a few familiarities to the overall genre it is representing, still presents itself as a fine and charming story told by two competent storytellers. The film’s first half focuses on the attempts of Jon Hamm’s sports agent to find new star athletes in India via a reality show, which he amusingly is inspired to do by watching both a cricket game and footage of Susan Boyle’s performance on Britain’s Got Talent (by the way, as a Brit it’s rather mind-blowing to see Ant and Dec in archival footage in a Disney movie; no reason for bringing it up, it was just a bit strange for this reviewer). This section of the film allows for some nice atmospheric shots of India, as well as little bit of casual stereotyping which may or may not cause an uncomfortable feeling inside. It is also the part of the movie where it feels more alive, compared to its second half which brings successful athletes Rinku (Life of Pi’s Suraj Sharma) and Dinesh (Slumdog Millionaire’s Madhur Mittal) to LA to train and become accustomed to the American lifestyle. This latter half, on the other hand, is where the classic sports movie formula starts to seep in through the cracks – the rookies fail at first but get better with every passing montage; doubt is expressed over whether they can accomplish their goals; we all know it inside and out. It’s not terrible, but compared to its more energetic and upbeat India-set first half it’s a little disappointing to see it drop like that. Though Hamm is as charismatic as he always is in anything he’s in as the lead, he cannot wrestle down playing a difficult character to sympathise with. After he blows up at his Indian hopefuls after a failed deal with another client, and just a few scenes later yells at Lake Bell’s love interest after she causes a trip to the hospital, there’s not much sense in that we should be on his side if these are his true colours. Of course he goes through a small number of redemptive actions afterward, but it’s not much for us to forget how much of a jerk he can be when all that’s important to him is the business. The movie certainly addresses this major character flaw, but doesn’t do so for a number of other dumb mistakes he makes along the way, including leaving a couple of young Indian men, who have never been outside their home country before, alone in a hotel room and then later at a party. No prizes for guessing that only bad things happen in both instances, and it’s all Hamm’s character fault that they occur. Very few members of the supporting cast get as much exposure as leading man Hamm, which is a shame because they are a talented bunch indeed. The Daily Show’s Aasif Mandvi doesn’t get a whole lot to do as Hamm’s right-hand man and business partner, Alan Arkin seems bored out of his mind before disappearing after the India section and only reappearing during the third act, Bill Paxton is only okay in a more subdued role than he’s used to, and though Bell has a lot of on-screen charisma to match Hamm’s she is saddled with a character who once more doesn’t have much to do outside be a love interest and surrogate mother to the aspiring athletes. The biggest casualty, however, is that Rinku and Dinesh – who should arguably be the most important characters aside from Hamm’s – are not given definable personalities or even characterisations outside of wide-eyed innocence and misinterpreting American customs. Hell, we learn more about Pitobash Tripathy’s energetic and adorable translator/aspiring coach more than we do the actual athletes themselves. It’s a shame, because we’ve seen Sharma and Mittal act well in other movies but they’re given nothing in a film where their characters should be the defining piece of the puzzle. 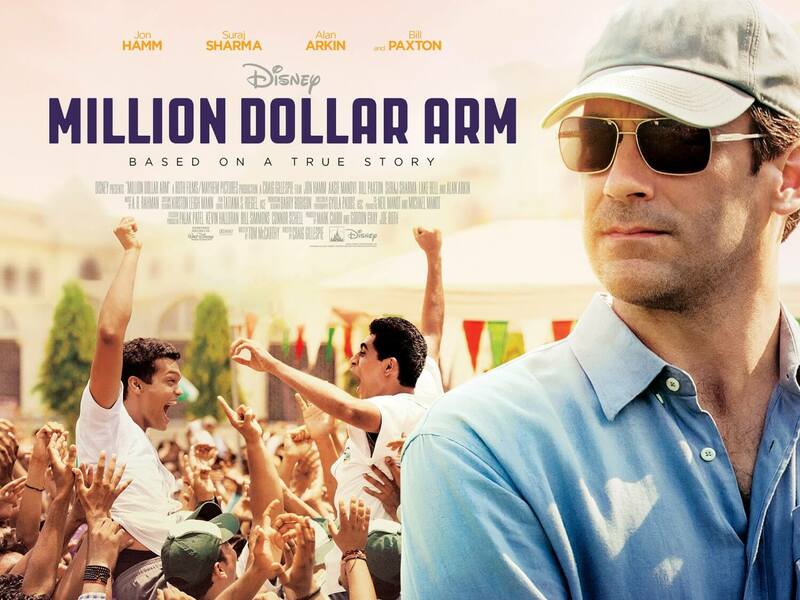 But once again, we come back to the theory that a formulaic film can work as long as the execution is spot-on, and like how What If was a decent example of a romantic-comedy despite its obvious formulaic tendencies Million Dollar Arm acts well as an entertaining if imperfect entry into the sports genre despite not doing much to subvert it or change if for the better. We wouldn’t have it any other way.